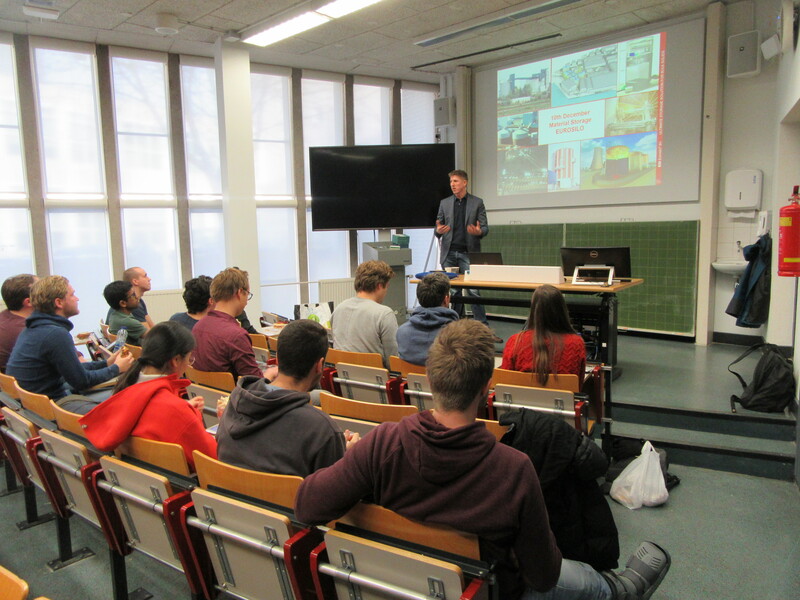 On the 10 December ESI Eurosilo came to the TU to give a lunch lecture in collaboration with Dispuut Transportkunde Pandora. Richard, sales director at Eurosilo delivered a presentation on the topic of “Large scale coal storage in a Eurosilo.” The lecture proved very informative in detailing how the company overcomes the typical operational issues faced by silos as well as giving some example projects that have been completed in recent years, including an incredible underground coal storage solution in Helsinki, Finland. The lecture coincided well with the master course “Dynamics of Materials & Equipment Interaction.” which students are currently following and perhaps some individuals even found direction towards a future graduation project. ESI Eurosilo is also one of the companies TEL students will have the chance to visit during the Germany trip in coming February, so this was an excellent opportunity to get a glimpse of what’s yet to come. For the first time, Dispuut Transportkunde Pandora also offered the lunch lecture to bachelor students as well as TEL master students. This provided a great opportunity for prospective TEL students to get a feel of the topics covered on the master programme and to gain extra knowledge on the types of industry that this track prepares students for. The dispuut plans to extend this offer to future events, so bachelor students are encouraged to keep their eyes on our website to get a chance to be involved in these upcoming opportunities.